What are your plans this summer? Perhaps you will be sitting by a lake, enjoying some time on a patio or lounging by a pool. Whatever your plans are, summertime is the perfect time to enjoy eating live, whole, fresh foods. From wild blueberries and juicy oranges, to buttery pears and fresh herbs – this is the best time of year for taste! In this edition of the Dr. Joey newsletter, you will find articles, products and recipes designed to tempt your senses on many levels. From “green” pans that will help you make the most delicious dishes to goji berries and help planting your own organic garden –you will find it all. If you missed Dr. Joey’s stunning weight loss finale on Cityline, click here. You won’t believe the results! The cracker aisle is full of options that can leave you confused but Edward & Sons keeps it simple with their gluten-free, all-natural brown rice snaps. The plain variety has only two ingredients – organic brown and white rice flour. At 60 calories for 8 crackers, you can dress these crackers up with goat's cheese, avocado, nut butter, hummus or whatever tickles your fancy. The snaps come in 9 flavors and are available at your local health food store. Barbara's Bakery is known for their low-sugar, wholesome cereals but they also do cereal bars!These sweet, fruit-filled bars are made with oats and barley instead of wheat and are sweetened with fruit juice instead of sugar. We want the convenience of non-stick but we don't want the known carcinogens and pollutants like Perfluorooctanoic Acid (PFOA) and Polytetrafluroethylene (PTFE) in our food and the environment. The solution is the GreenPan™, the first eco-friendly PFOA/PTFE-free fry pan that uses a Thermolon coating to ensure healthy non-stick cooking. 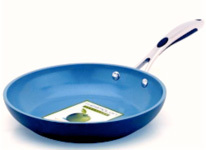 GreenPan™ performs just like regular non-stick cookware but release 60% less carbon. It's also made with used, uncycled stainless steel and ergonomic aluminum handles. Founded in 2009 by under-30 entrepreneur Chris Wong, Young Urban Farmers is an up-and-coming Toronto-based business that designs, installs, plants, and maintains edible vegetable gardens in backyards, front yards, balconies, and rooftops across the GTA. All the work is done for you, leaving you with a beautiful, deliciously edible landscape. Bonus: Shulman Weight Loss clients get 10% off any container garden setup until July 31 and consultations are always free. Check out www.youngurbanfarmers.com to get started on growing your own produce! How do you get a clinically effective dose of probiotics into someone who doesn't swallow pills? 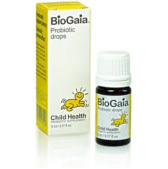 BioGaia, a world leader in probiotics, specializes in probiotic supplements for infants and children. Its chewable tabs and drops contain 100 million live Lactobacillus reuteri bacteria, the same bacteria found in mother's milk that's designed to build her baby's immune system. L. reuteri is proven effective against diarrhea, infant colic, H. pylori and gum disease. Check out www.biogaia.com and order by calling 1-800-263-4057. Goji berries are also high in antioxidants beta-carotene, zeaxanthin and vitamin C. They actually have more beta-carotene than carrots and more vitamin C than some oranges. Try goji berry tea or sprinkle some on your soup or hot cereal for an exotic twist. The dried berries contain 150 calories per 1.5 ounces, 5 grams of protein, 32 grams of carbohydrates and no fat. The newest trend in the food world is an omnivorous diet that includes meat, but not as the centerpiece of the every meal. 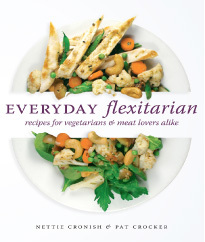 Practiced by visionaries like David Suzuki, Albert Einstein and even the Dalai Lama (yes, he eats meat), the flexitarian diet has endless appeal for mostly vegetarians and hard-core meat eaters alike. In their new cookbook, Canadians Nettie Cronish and Pat Crocker make the transition to “meat optional” eating easy for families with recipes that have a vegetarian and meat variation. For instance, you can enjoy Mâche with Roasted Beets, Walnuts and Blue Cheese or have an equally tasty and balanced meal with Mâche with Roasted Beets and Grilled Beef. Each dish comes with instructions on when to separate the vegetarian portions, when to add meat or fish, and what to add instead of meat in order to maintain healthy protein levels. Keeping with the health-conscious theme, Cronish and Crocker discuss what organic really means, how to pick quality produce and how to dish out appropriate serving sizes. Delicious kid-friendly flexitarian recipes and desserts like Quinoa Pecan Fudge Cupcakes are also included in this beautiful book. Everyday Flexitarian is all about inclusion, versatility and simplicity, and that's why we recommend it for great food ideas. Toss the mango, onion, bell pepper, cashews and cilantro together in a large bowl. Squeeze the juice of two limes over mixture, hit it with the hot red pepper, toss and serve. In bowl, toss chicken with half of the oil and the steak spice; let stand for 10 minutes. In large skillet, heat remaining oil over medium-high heat; cook chicken, turning once, until golden brown and no longer pink inside, 8 to 10 minutes. Let stand for 5 minutes; thinly slice crosswise. Meanwhile, trim end of each lettuce, leaving core attached. Quarter each head lengthwise through core. For the dressing, in bowl, whisk together lemon juice, oil, Dijon, anchovies, lemon zest, garlic, salt and pepper. To plate up, arrange 2 lettuce quarters on each plate; top with sliced chicken. Drizzle with vinaigrette and top with shaved Parmesan. Slip one of the rice wrappers into the hot bowl of water and allow 15-2o seconds to soften. When the rice wrapper is soft, remove it from the bowl and place on a clean surface. Add chicken sliced, mango (or pears), 1 slice of avocado per wrap, pepper slices and fresh basil. Then fold over one end. Per serving: 330 calories, Total fat 8g, Protein 35 g, Carbohydrates 29g, Fiber 3 g.
Congratulations to Josee who just lost 50 pounds at Shulman Weight Loss Clinic!